This is part 2 of my series Secure your ASP.NET Applications. In this article, I will describe what exactly Cross Site Scripting (XSS) is and how a hacker exploits it and how we can prevent XSS attacks. 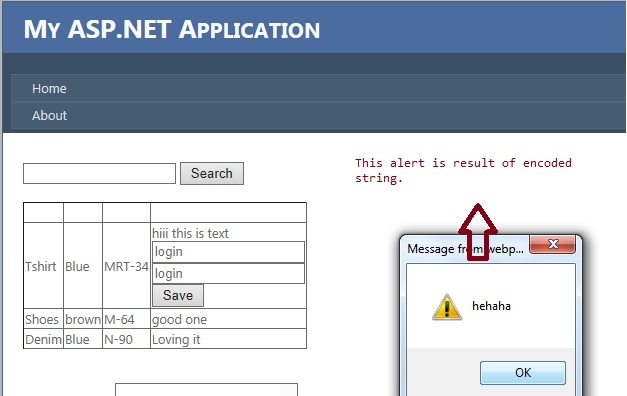 Part 1 of this series is available here which is about how to secure your ASP.NET applications from SQL injection attacks. Persistent (when code remains stored somewhere, example - code stored in a database and executed on the client browser over and over, which makes it more dangerous). DOM based XSS attack (both reflected and persistent can fall in this category, attacker can manipulate DOM elements and can use DOM data). In the above example I simply pass the HTML in the query string which gets reflected in the web page. This is just to show the attacker can use proper scripts with intention to get your credentials. In the above example we are passing an HTML element and script in our label which gets assigned as it is and becomes a legal script, and the element for a page gets reflected in our page and shows the effects. 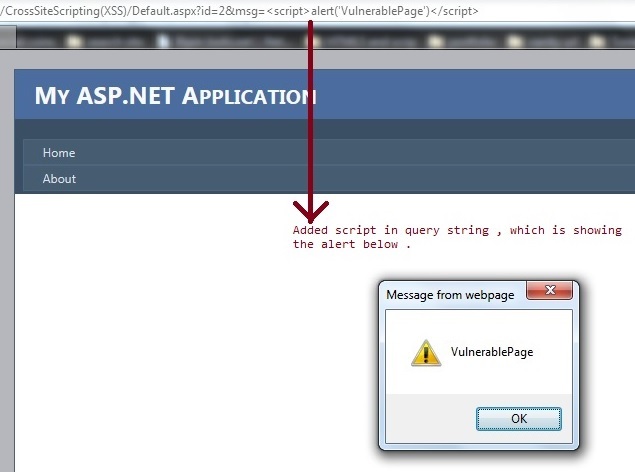 This is just a basic example of how an attacker tries Reflected XSS, scripts, and their use can be too harmful. //that's the developer cause who developed vulnerable web applications . As attacker is not inserting a direct script, he is inserting an encoded string which contains a script. These are new ways an attacker finds to exploit XSS. Or we can use a direct encoded string, I just use JSON to show this; this is also not a safe way. Now he can see the cookies you are saving, and that might be user credentials or any important data. Your code output should be HTML encoded but make sure while storing data, it should not be encoded. Encoding and storing can lead to double encoding. 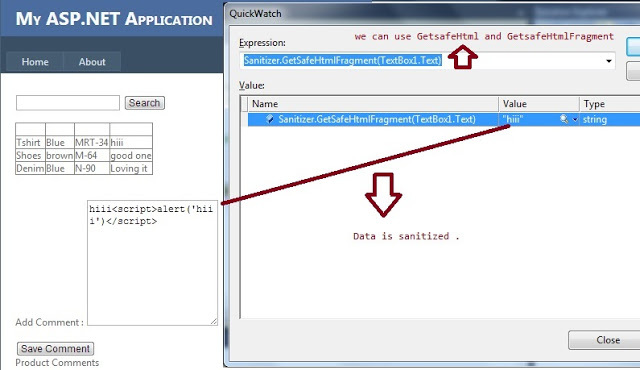 So for encoding we can use AntiXss sanitizier's GetSafeHtml() and GetSafeHtmlFragment(). To download AntiXss, go to MS Visual Studio's Tools > Library Package Manager > Package Manager Console > Install-Package AntiXss. It's better to use these methods if we really don't encode data. Specify page encoding in web.config because the attacker can change the encoding to UTF-7 which has a different standard to write the lines and can make it tough to filter out the script code in the page. Apply content security policies to allow the script of your own host, or to allow the script of any host like Google and Microsoft. We can add a header to stop scripting from the attacker site or any third party site. Although it is not full proof because IE does not support this, but we can still use this as an additional thing to stop XSS. Add the following code to allow scripts just from your host. // (Firefox 4 to Firefox 22, Thunderbird 3.3, SeaMonkey 2.1). Do not use filter approach to find the script tag and replace that, there are many cheat-sheets available on the internet for XSS. A simple example that an attacker can use: onload=alert('anything'). Data validation: you can't trust the user input, just make sure the data is exactly what your application expects. Don't set the ValidateRequest attribute to false. When it is true it might throw an error; to prevent this error make sure your data is properly encoded before sending it to the server. Be concerned where DOM elements are being created and modified. Use functions such assetAttribute and document.createElement('div') rather than document.writein and$('div').html(). Force the user to update IE 6 which is very much vulnerable to XSS. IE6update.com is a better solution for that. Audit every place where data is assigned. Know your control behavior as a label can't post the values and text-box can. So better encode text-boxes first. You can use a third party control to check the vulnerability; for Firefox use XSS-ME and for Chrome can use DOM-SNITCH. Update yourself on regular basis ,check new ways of the same attack. The attacker invents new ways to do the same attack in their spare time. OWASP has a very good cheat sheet and defense for XSS. OWASP has regular updates about these attacks. 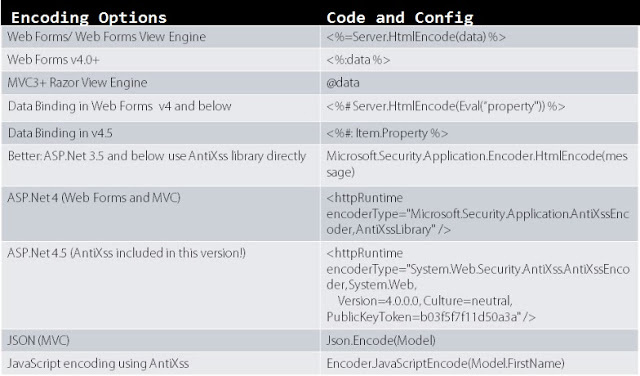 Know ASP.NET encoding ways and use proper config statements to make changes. All the above mentioned methods are useful to prevent XSS attacks.